We have a decent-sized blackberry bush in the backyard. I know some people think they’re annoying and get rid of them. But I love having the blackberry bush at home for some obvious reasons: it grows and spreads no matter what, the berries are tasty and filled with good vitamins, they’re a nice color, and they’re free. Now they’ve finally started to ripen enough for harvesting. My son loves picking, catching and hunting for food, just like me. Every morning he asks if we can go and pick some berries. When we picked these the other day, there were bees working busily around the flowers. We watched them closely. They really are the most hardworking and focused creatures. I couldn't help feeling the appreciation towards them for their amazing contribution to create these sweet delicious berries. With blackberries, I usually make instant jam or bake pies, but this year I decided to go more luxurious and make a really good puree, since we'll have thousands of berries to harvest. The other day, in the fridge, I found some rice milk that I bought by mistake, so I thought I’d make some rice pudding with it. I didn't want to drink it myself, and the kids don't seem to care for it much either. For me, rice pudding is a odd kind of dessert. When I first came across it, I couldn’t bear the idea of rice mixed with milk, because I grew up in Japan and I like my rice in a little bowl, accompanying a meal. I was also lactose-intolerant. But my fascination with British culture finally convinced me to accept it. Also, my hubby's family is Norwegian and they LOVE their rice pudding. So now I make it quite often. I also happen to have a really good quality rice from Culinary Collective project, which I haven't had a chance to use it yet. CC is a food importing company run by an amazing woman called Betsy), which is perfect for making it. It did took me a bit longer than it should to make puree. 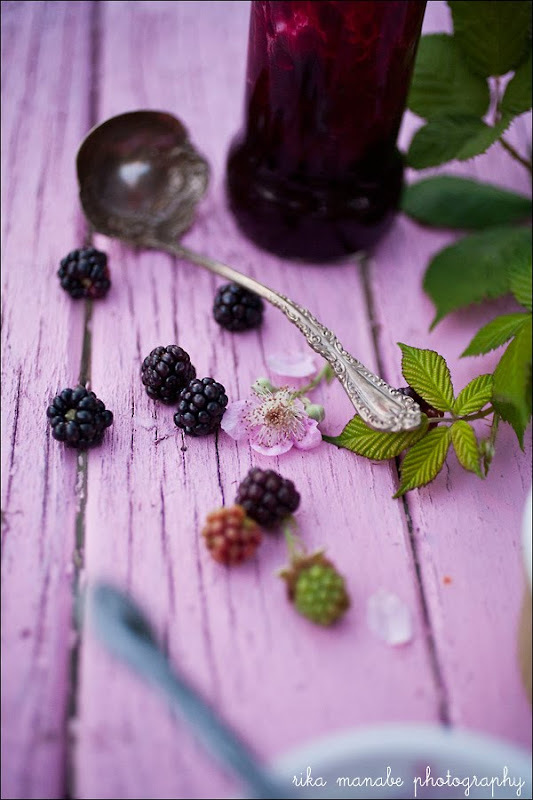 Blackberries are runnier than other berries, have tougher and bigger seeds, and thick cores. I may have cooked the berries too long and made it too thick, but it worked out in the end. I made rice pudding a little runnier than usual because the puree was pretty thick and rich like true pure goodness. I also add some grounded fresh cardamons in pudding since that's how my hubby likes it, and so do I, of course. Over the next few weeks, we'll have tons of berries to pick. 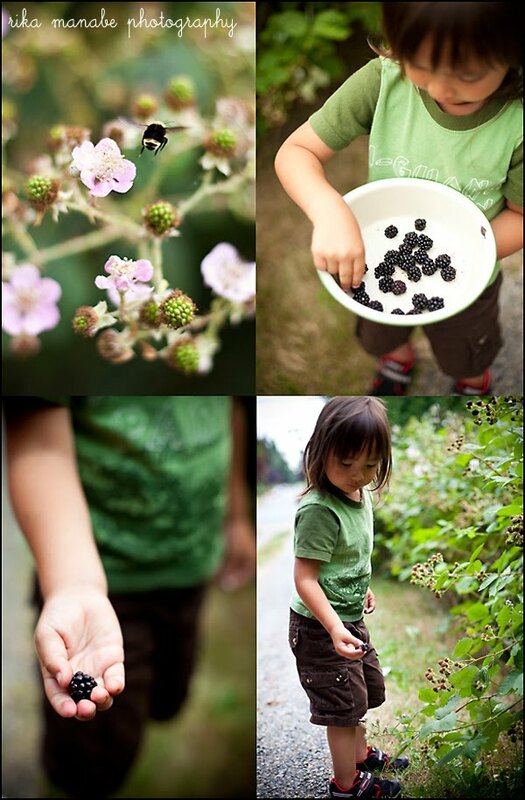 My son will be laboring at the blackberry bushes for me. At least until he gets bored with it. Mix the berries with the sugar and lemon juice in a bowl, then transfer the mixture to a pan. Heat for 45-60 mins on medium heat. Strain out the seeds and other unwanted bits, and pour into sterilized jars. It should last for a year. Rinse and soak the rice in water for 15 mins. Put the rice, rice milk, sugar and salt into a pan and heat for 30 mins. on medium heat. When the rice is cooked al dente, add the vanilla extract and cardamons. Looks so yummy. Love your pictures. They're warm, soft and beautiful. Reminds me a bit of Canelle et Vanilla. This recipe looks great and not too sweet.